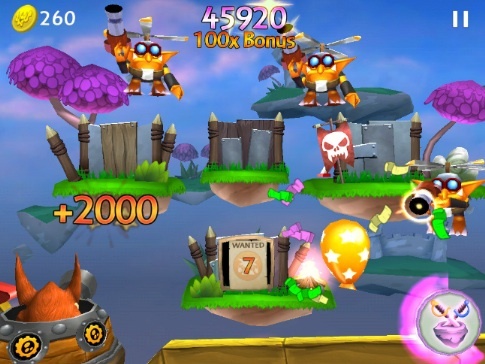 Blast enemies as one of 30 plus characters, unlocked using codes included with the toys. Here's one thing no one expected in today's App Store update, a Skylanders game. Activision surprised everyone by announcing a spin-off title for its immensely successful Skylanders IP called Skylanders Cloud Patrol. Now don't get too excited. This isn't a fully-featured adventure similar to the console and even 3DS versions. It's more of an arcade style shooter, as players hop into a flying gunship and take down bad guys. In this case, trolls. What's especially cool is the ability to unlock new characters using web code cards included with each Skylanders action figure. In fact, you can play with more than 30 different characters. We'll have a review as quickly as possible, but for now, it's great to see this series on Apple's "i" devices.